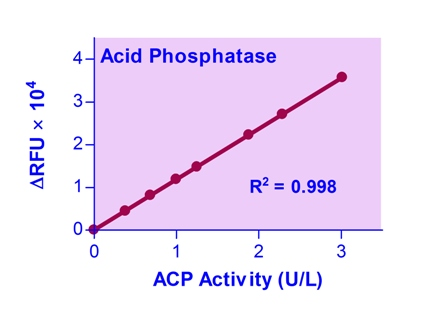 Acid Phosphatase (ACP) is an enzyme which catalyzes the cleavage of phosphate groups from other molecules during digestion. Acid phosphatase can be found in lysosomes and become active after fusing with endosomes, acidifying the pH and, thus, creating an optimal environment for ACP. ACP can also be found in bone, spleen, liver, kidney and blood. Serum levels can be used as a biomarker for prostatic carcinoma, although prostate-specific antigen (PSA) is more widely used. This non-radioactive, fluorimetric ACP assay is based on the cleavage of methylumbelliferyl phosphate. Methylumbelliferone becomes intensely fluorescent after addition of the stop reagent. The increase in fluorescence at 360/450 nm after addition of the stop reagent is directly proportional to the enzyme activity.